Dried and fresh herb, skin washes, tincture, capsules. Many feverfew products are standardized to a specific parthenolide content, but a holistic approach is to use the whole herb - the fresher the better. If you are not allergic to ragweed, this is a great herb to grow and use fresh. 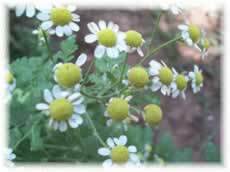 (It grows freely along my back garden fence) Unfortunately, many folks are allergic, and should always take feverfew in the form of encapsulated freeze-dried herb. Feverfew is a bitter herb for tea, and not one you would drink just for the pleasure. To prevent headaches chew 2 or 3 fresh leaves per day. To make a flea rinse for your pet, pour boiling water over the fresh herbs and let stand until completely cooled. Strain and apply wetting the fur and skin thoroughly. Do not towel dry or rinse.